Tonight is our monthly downline meeting. I look forward to this meeting and really enjoy chatting with all of the demonstrators in the HeArtisans group. They truly are an extraordinary group of ladies and stampers. The theme for our trades is to pick a card out of the catalog and change it in some way (colors, stamp set, etc.). 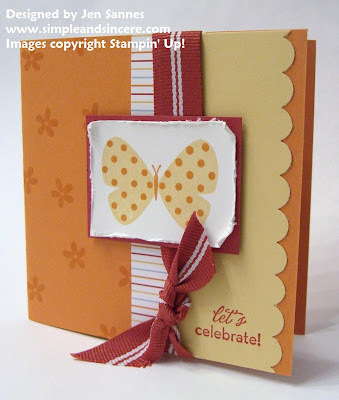 I decided to use a card that is in the March issue of Stampin' Success (the magazine that Stampin' Up! sends out to their demonstrators each month). If you are a demonstrator, check out the card on the back cover. I thought the layout was simple and fun, and easy to alter. Since my kids have been sick and I was out of town for part of the weekend, I needed something quick and easy. Often, I agonize over my trades, wanting them to be "just right." This one came together very quickly, which was a nice change of pace! I used the Flight of the Butterfly set and the "let's celebrate" from On Your Birthday. I LOVE the springy, happy look to this card! I'm also demo'ing a card tonight, using some SAB goodies. I'll share it with you tomorrow! Happy Tuesday!